Feeling wishy-washy about painting around the shower? Take this advice about the best paint for bathrooms and send your worries down the drain. Q: My master bath is in need of a quick refresh, but I’m worried about paint peeling. What’s the best paint for bathrooms? I’m looking for some guidance on both color and finish. A: While there are no hard rules about the best paint for bathrooms, a few key choices can steer homeowners in the right direction and give a satisfactory result. Read on for some guidelines on color choices, finishes, and the painting process. Wall color can affect mirror reflections. 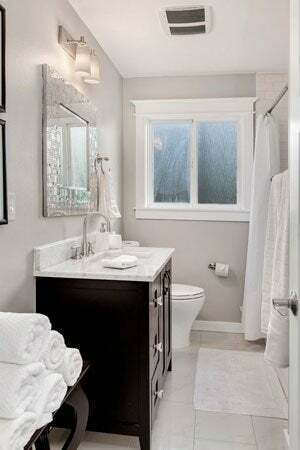 Whites, creams, grays, and pastels are popular bathroom color choices for good reason: they’re calming, easy on the eyes, and flattering to your reflection. These neutral shades don’t recast light in a way that alters complexion in the mirror. A vibrant blue or green, on the other hand, may cast an unnatural sheen onto your skin after interacting with the bathroom’s natural or artificial light, exaggerating dark circles and blemishes. If anyone in the household uses the bathroom for primping and priming, a subtle neutral wall color might be the wisest (and most flattering) choice. Bathroom paint should offer mold and mildew resistance. 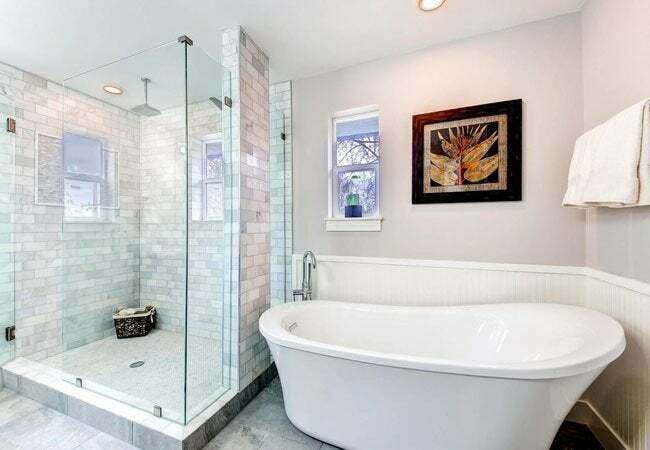 Since bathrooms are splash-prone areas that retain moisture for long periods of time, they are prone to mold and mildew–especially if the bathroom doesn’t have proper ventilation. To prevent these health hazards, homeowners should opt for paint with anti-microbial additives that resist mold. Many options for this type of paint exist on the market today, such as Benjamin Moore’s Aura Bath And Spa Matte Finish and Zinsser’s Perma-White. Once on the wall, these paints will kill existing mold and prevent new mold from growing. Use a moisture-resistant primer to prevent peeling. Peeling paint occurs as a result of moisture seeping between the paint and its surface–a common occurrence in unventilated areas like showers, where steam rises and gets trapped. To prevent peeling, apply a coat of moisture-resistant primer to the ceiling or walls before you add your mildew-resistant paint color. An ounce (or rather, a pint or gallon) of prevention can save you quite a bit of hassle in the long run since you won’t have to touch up the paint job nearly as often. Or, select a semigloss or high-gloss paint. As an alternative to mold-resistant paint, homeowners can coat their bathroom walls in a paint with a semigloss or high-gloss finish. Glossy paints don’t prevent mold, but they’re easier to clean and maintain than paint with flat and eggshell finishes. If mold ever pops up in the bathroom, removal won’t be overly difficult. Homeowners who don’t like the sheen of glossy paints can opt for satin instead; it’s slightly less reflective, yet still not difficult to clean. Be sure to prep before painting. Before applying mold-resistant paint, clean the bathroom walls and remove any existing mildew with a DIY solution of three parts water to one part bleach. Use painter’s tape to block off your corners, doorways, floorboards, and any other spots you don’t want to paint, and make liberal use of drop cloths or plastic sheeting to protect the floor, countertops, and toilet. Start painting in the corners and work your way across the walls. If possible, let the paint dry for a couple of days before taking a hot shower. Ventilation is your friend when it comes to long-lasting paint, so keep the air flowing through open vents, doors, and windows. Then watch that fresh coat of paint thrive for many years to come!